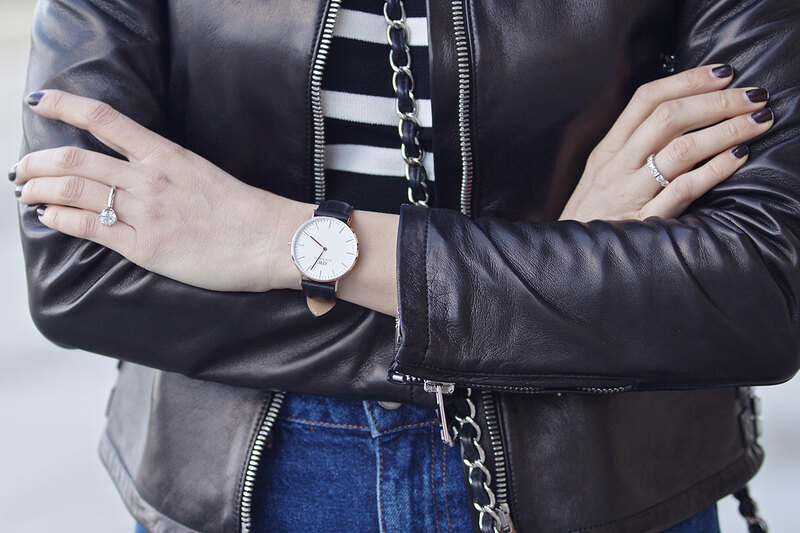 One of my favourite pieces for Spring is the biker jacket. It goes beautifully with pretty much everything, from pair of jeans to light silk or lace dresses. To be honest my search for the perfect biker jacket was endless. In between I got few of them but couldn’t find the one to steal my heart until I saw this one by Gucci. It’s light and doesn’t have tons of useless zips all over it. And the leather is so soft, you just want to cuddle in it. 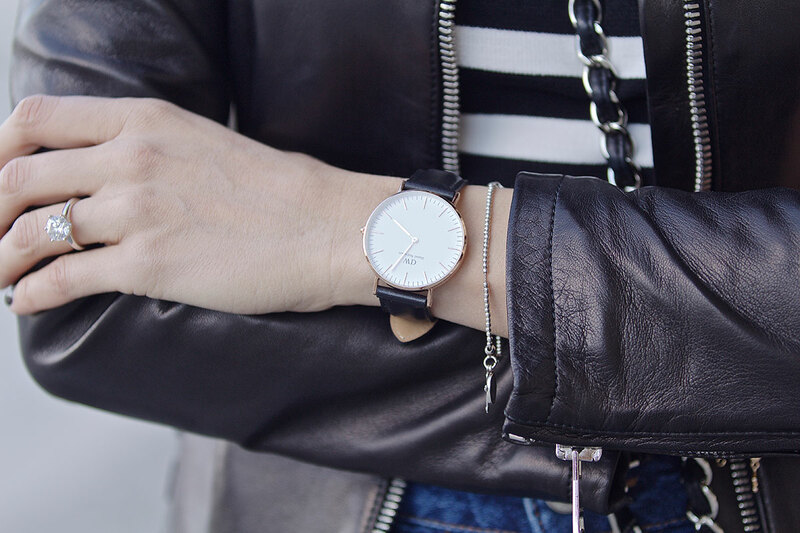 Another statement piece here is my Daniel Wellington watch that I LOVE so so much! If you still don’t own one of these amazing MUST HAVE watches you can get one with our Promo Code HERE . The promo code is thegaragestarlets and it will give you 15% off! Enjoy! I am wearing: Biker Jacket: Gucci / Top: Zara / Jeans: Topshop / Ankle boots: Saint Laurent / Bag: Chanel / Sunglasses: Christian Dior / Watch: Daniel Wellington, get it HERE with 15% off with our promo code! That jacket is to die for! Watch is absolutely beautiful as well. 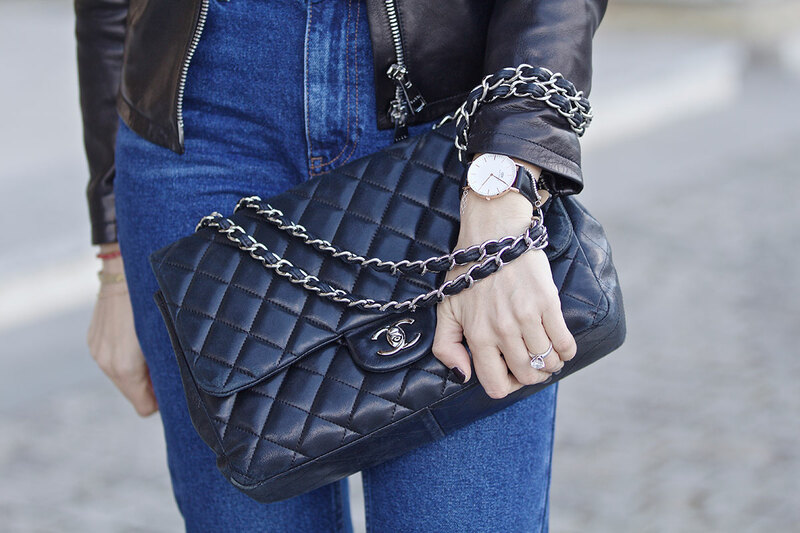 Black, stripes, denim and Chanel! Simply gorge! And this Gucci treasure is amazing for real!!! Lucky you!! So cool that you’re a friend of Alicia Keys! Such an inspiring woman and singer! This outfit is amazing! I love the boots with the socks, great look! Biker jacket is my fav spring piece too!!! Cool look doll!!! Very cool biker jacket ! You look gorgeous ! wow this look is absolutely perfect!! i’ve been obsessed with high waisted jeans lately! oh and your sunglasses… such a dream! Perfect outfit. Love the ankle boots and the sunnies! I love biker jackets too…and this outfit is phenomenally stylish…love the rock vibe!!!!!!!! Great look, love this classic outfit. I love the sunglasses and the boots! They’re so witchy! Love this chic street style look! That jacket is amazing! Amazing pictures! Great inspiration for this spring! I totally love your style! The Jeans fits you perfectly! love the simplicity of the outfit! suits you well!